The battle over voting power continues - even in Oregon. In Oregon, we have achieved a modern, convenient voting system and have among the highest voter participation in the country. But we can’t take this for granted. Voting is power. And so the struggle to suppress or distort the vote is ever present. Yes, even here in Oregon, we continually see attempts at legislation or ballot measures to suppress the vote. Moreover, as times and technology change, systems must be modernized. Through ongoing vigilance and leadership, we continue to defend and advance the vote. Threat on the Horizon – Keep an eye out on Oregonians For Immigration Reform (OFIR), a group recently designated by the Southern Poverty Law Center as a Hate Group for its close ties to White Nationalists and history of racist provocation. This group has been testing ballot measure language aimed at disenfranchising eligible Oregon voters. 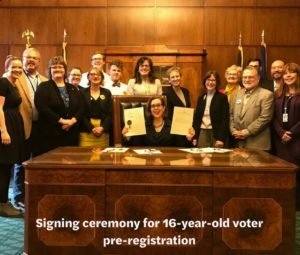 Recent Progress – With leadership from the Bus Project and help from Common Cause, Oregon passed legislation in 2017 to allow voter pre-registration for eligible 16-year-olds.